This website is in NO WAY connected to hate groups or established for any political/racial agenda. 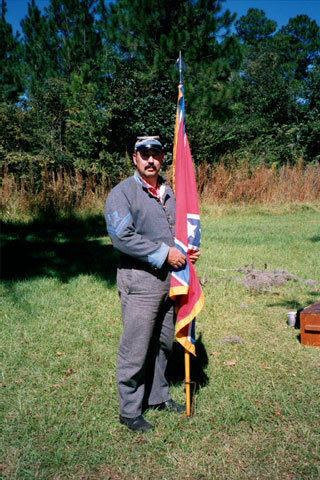 perpetuation of Southern Battle Flags, and Civil War re-enactment. This is a Love affair (Making flags) with preserving our heritage. I am a re-enactor and will trade! 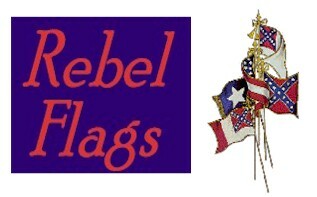 Click on the Confederate Seal or go to the bottom of the page to see my work!! pre-fabricated, and a custom flag was too expensive! So, I decided to buy a used sewing machine and try to make one myself! The flag did not turn out too bad, so I have been making custom made Battle Flags since that time. and appliqués. Custom work is my specialty, I pride myself on quality work and attention to detail. I was recently promoted to Ordnance Corporal, and served as a "file Closer"
graveside Ceremony for 43 Confederate Veterans and 1. Revolutionary War Soldier buried in the Churches Cemetery. or a sketch with dimensions. Note: I can make any flag as long as I can see a picture of some kind.